El Salvador's Foreign Minister Carlos Castaneda, left, speaks as China's Foreign Minister Wang Yi listens at a signing ceremony to mark the establishment of diplomatic relations between El Salvador and China at the Diaoyutai State Guesthouse in Beijing, Aug. 21, 2018. Taiwan vowed on Tuesday to fight China’s “increasingly out of control” behavior after Taipei lost another ally to Beijing when El Salvador became the third country to switch allegiances to China this year. Speaking in Taipei, President Tsai Ing-wen said Taiwan would not bow to pressure, describing El Salvador’s decision as further evidence of China’s efforts to squeeze the island, which have included regular Chinese bomber patrols around Taiwan. “We will turn to countries with similar values to fight together against China’s increasingly out-of-control international behaviour,” Tsai said. Taiwan Foreign Minister Joseph Wu told reporters earlier that Taipei was not willing to engage in “money competition” with its giant neighbor. Beijing considers Taiwan to be a wayward province of “one China,” ineligible for state-to-state relations, and has never renounced the use of force to bring the island under its control. In Beijing, the Chinese government’s top diplomat, State Councillor Wang Yi, said El Salvador had made the right decision. “I’m confident that the people of El Salvador will feel the warmth and friendship of the Chinese people and derive tangible benefits from its cooperation with China,” Wang told reporters alongside his El Salvador counterpart, Carlos Castaneda, shortly after the pair signed an agreement establishing ties. 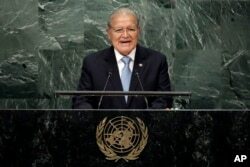 El Salvador's President Salvador Sanchez Ceren addresses the 71st session of the United Nations General Assembly, at U.N. headquarters, Sept. 22, 2016. El Salvador’s president, Salvador Sanchez Ceren, announced in a nationally televised speech that his government had broken off diplomatic relations with Taiwan and instead established ties with China. “We are convinced this is a step in the right direction that corresponds to the principles of international law of international relations and the inevitable trends of our time,” Sanchez Ceren said. “China will not get unification with Taiwan by luring away our allies. What China did was to humiliate Taiwan repeatedly without getting any respect from Taiwan’s people,” Taiwan's ruling Democratic Progressive Party wrote in a statement. “The United States urges China to abstain from coercion that would jeopardize the security, or the social or economic system, of the people on Taiwan,” she wrote. 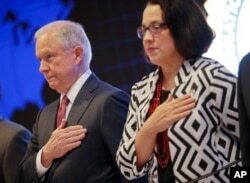 U.S. Attorney General Jeff Sessions and U.S. Ambassador to El Salvador Jean Elizabeth Manes stand during the playing of the U.S. national anthem during a graduation ceremony at the International Law Enforcement Academy in San Salvador, El Salvador, July 2, 2017. ​The U.S. ambassador in El Salvador, Jean Manes, wrote in a Twitter post on Tuesday the United States was analyzing El Salvador’s “worrisome” decision to break ties with Taiwan. “Without a doubt, this will impact our relationship with the (Salvadoran) government. We continue supporting the Salvadoran people,” she wrote without elaborating. Ahead of next month’s summit between China and African leaders in Beijing, China has also been upping the pressure on Taiwan’s last remaining ally on the continent, eSwatini, formerly known as Swaziland, to come over to China’s side, diplomatic sources say. “We hope the relevant country can see clearly the world’s trend,” Chinese Foreign Ministry spokesman Lu Kang told a daily news briefing, when asked whether eSwatini would attend the summit. China’s hostility to Taiwan has grown since Tsai’s election as Beijing fears she wishes to push for the island’s formal independence, a red line for China. She says she wants to maintain the status quo but will defend Taiwan’s democracy.